i must confess my 'smile' has slipped a little, being so soon into the new shiny year this has caused some fretting about my resolutions and if i have it in me to keep them up. my new year smile started slipping on sunday and quite honestly by this morning i noted a terrible scowl had taken its place. the nice young man stopped by and twiddled with things that needed twiddling with, things that were causing my smile to slip. after a little bit of twiddling he declared my problemo sorted and he left with a smile on his face. so whilst my smile was slipping over the past few days, i did things to make it cling on. 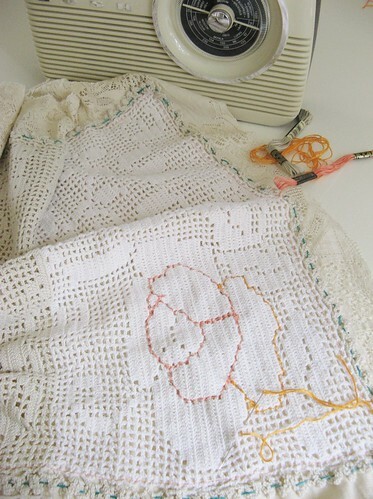 i stitched (almost obsessively i might add), patching lace and old linens together, i appear to be quite smitten once again with creams and whites, whilst listening to Radio 2.
i found one small ray of daylight in the shed to get some photos done for the book. i felt i was quite capable of doing this by myself (aided by Carlos my camera), but little olive felt otherwise. i pondered my written word, for Janine tells me there can be no more procrastinating, i need to pull my knee socks up and get cracking with my tippity typing. i told her i would do my utmost best and so today i sat down to start!!!! i conquered my fear of the 'word document' and its automatic layout thingy. "Tif, what exactly is it you wish to do with the word document?" 30 minutes later i am the proud owner of a blank, perfectly spaced, no bullet points, and other such nonsense popping up when and as it feels, fangle dangled word document. my smile was the biggest it had been all week, i reached for my cotton hankie, blew my nose (Mr Lurgy is hovering close by) and felt a sense of peace come over my little computer. actually i might just blame Mr Lurgy for the slipped smile and terribly awful melt down, infact upon looking back at the evidence, this looks like his kind of doings. "many moons ago, i was born at home in 1968"
I'm always so inspired by your lovely ideas...thanks for sharing and bringing lots of smiles to faces! Computers do that to me too!! I think they change in the night just so they can annoy you! How I relate to the trials and tribulations of the computer age. If it weren't for the help of my dearest husband and son, I would still be tap-tapping on ye old typewriter. A week doesn't go by that my husband isn't asking me -"what did you do now" as he's holding the computer at me....."what buttons did you push? "...I'm still not quite sure how my cell phone works!!!! I like Colin the Computer. It makes him sound sensible and not flighty as I sometimes think computer brains act. 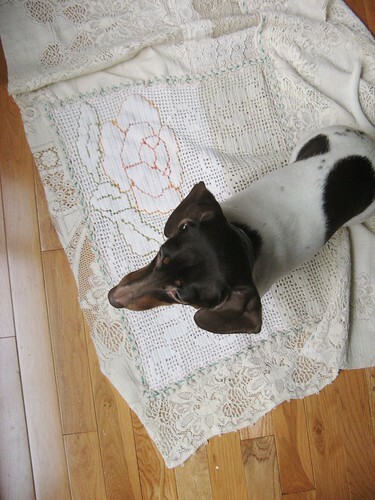 You have trained little Olive well - to feel a keen sense of duty and protective pride over the cream and white linens in the house. I just want to stroke her velvety looking little head and ears. But I'm sure she would just look at me with a "I'm sorry but I'm on duty, ma'am" look. oh! i loved reading this! your "word" frustrations are so perfectly stated...why does the program do that stuff? i'm a new dottie angel fan...i love the space you have created here in blog-land! I love the the way you are doing things. I am often here in your blogg - it is a good place for dreaming! all the spangle of technology. enjoy the challenge more than us! need to fuss the tech stuff! Boy can I relate! I just paid $202 last week for someone to come in and fix this blinkity-blank laptop, and it is still doing the same blinkity-blank things he was supposed to fix. I took it in last week so the manager could see what it was doing, and of course, it worked better than it has in a year. Oh how I wish I could stomp it and beat it to pieces! I have a Mac desktop computer, and I have been working on it this week now that I have it set up with my Verizon modem, and there is no comparison between it and my Windows laptop. Everything goes so smoothly on the Mac, and NOTHING goes smoothly on the laptop. I have been scowling, cussing, gritting my teeth, and pumping enough cortisol to kill me. They used to say that a computer only does what you tell it to, but I don't hear anyone saying that anymore! Heck no! Everyone pretty well knows that computers are demon-possessed and have minds of their own. Not only do they do what THEY want to do, but they refuse to do what YOU want to do. OK, I will stop my rant now. I hope yours is working better for you now. 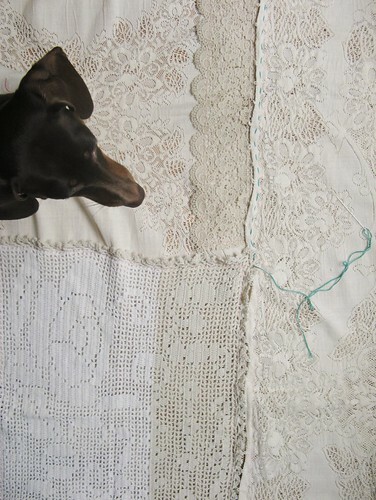 Looks to me as though little Olive is as much a lover of lace and crochet as I am! That was adorable, as was the funny and comical read you have provided for me tonight to accompany my hot cup of coffee! Computers can be frustrating, for sure, but when they are functioning like they should, they sure are great creative partners! Here's hoping Collin behaves as he ought to! (both your father and your computer)! Happy stitching like mad...and may you find yourself typing with an unmatched fervor! Stop in and visit for a break at some point! LOL Tif I feel EXACTLY the same about 'word'....Drives me to complete distraction sometimes suggesting I do this that & the other when I want to do NOTHING of the sort....I'm GLAD your woes were sorted....! I love your radio, and am happy to hear that your smile is back. Can't wait for the new book. Keep typedy typing! Oh my gosh..what a fun post. Thanks for the smile/laugh/giggle. Really. You are so funny. I feel like a dinosaur as well in this computer world. I'd love to buy your book. Love Olive. Colin is a great name for your computer. I call my computer Coco, short for Coconut Ice. I hate those scowly days but without them the smiley days wouldn't seem as smiley. So glad Mr. Colin is up and running properly. I love finding a new post in my reader file. It's just like having a visit from a friend. Your writing is delightful. With this post you made me smile! Please can your man come and visit me and deal kindly with my 'word document' too! I can't even type a letter to the school on mine! Hope your weekend is better than your week, although is does look like you've been upto some goodie goodness without Colin's help..
Have a great weekend Tif. Oh begone indeed bad scowling ways, yes, I bet Mr. Lurgy was the villain. How could you not be smiling when totally gorgeous little Olive turned up to inspect your work? AND young lady, what is wrong with speaking "granny"? Glad to hear you are friends with Colin, I often christen my computer with unprintable names! Have a great weekend Tif......... and calm. I do hope the nice young man fixed your computer problems permanently! And I also hope you will continue to keep a bit of "grannie" talk in your posts - it suits you well! wow. sounds like an ordeal! good luck with the book! looking forward to it. I'm glad you're 'up and digitaly running'again..missed you're blog-pieces! Great work you make, love the new patches with the embroidery and lace. Keep up the good work. This is my first ever comment, but as you had used my name in your post, I decided it was time to respond to your wonderful blog. I am a fairly ancient computer but I still seem to work OK most of the time. Just the occasional lapse. Drives my master round the bend just like my namesake in your house when that happens. However as we computers always say: The problem is nearly always garbage in, garbage out. Anyway, hope your Colin does the business for you from now on and the book goes well. Looking forward to reading it (or at least looking at the pretty pictures). Whenever my smile slips, I feed it and find it pushes back up. I have the unfortunate habit of getting cranky when I forget to eat. My kids and hubby now offer food when I snap. I hope you feel better and rest up. *The light shining through your curtain is heavenly. *I'm sure Olive was a great help. *Thank you for bringing a smile to MY face. *All the most lovely people are born at home (like my littles). *Wishing you many quiet hours to tippity type in peace. 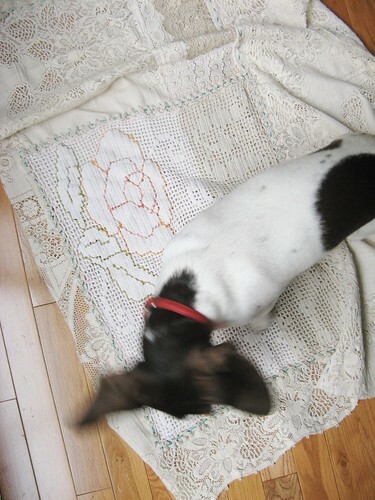 I love your pieced linens and old embroideries. 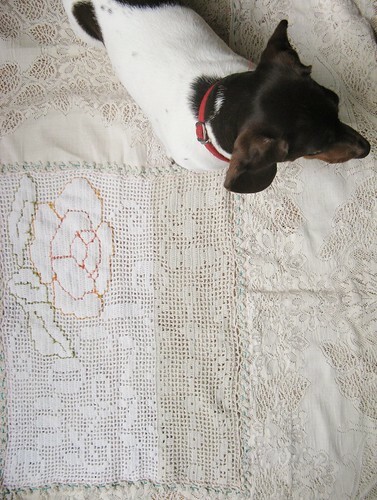 I am beginning to collect old pieces of table linen and embroidered sheets, mostly 1950s stuff. I had intended to make all sorts of things outof them but cant bear to cut any up yet, apart from the ones that are already showing bad wear. I hope your writing continues to progress! So why not my computer hu? you never ever fail to cheer me with your lovely words dearest readers!! my smile has been firmly in place the whole time i have been reading your comments! so wonderful to know i am not alone in the frustrations that follow from using 'Word' and anything else remotely techie! Do not fear, you are clearly quite clever with technology as evidenced by your lovely blog! It is the bloated and forever frustrating Word that is the culprit. Streamline your life as I and many other writers have done. There are so many lovely writing programs out there (many of them free). If you have a mac I can't recommend Scrivener enough. And for windows, the free and easy PageFour is a really lovely program. There's always Google docs as well. All of these programs export your file to a Word document so none will be the wiser. Trust me, writing will be something you will look forward to and you will breathe easy when you sit at your computer, if you have a platform that is as lovely to look at as your lovely life! Love your writing style! I too have Word. Works was so much easier. Dell told me, while I was ordering a new laptop a few weeks ago, that they've "done away" with Microsoft Works. A pity. maepress! thank you kindly for your grand advice! 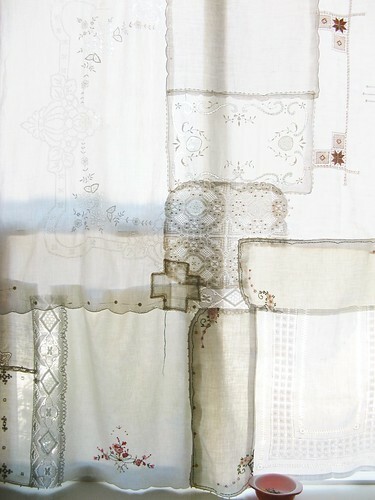 Oh my goodness I think your gorgeous patchwork curtain is beyond compare! The men in my family are always "upgrading" my computer and I do not consider it an upgrade. It is downright maddening.